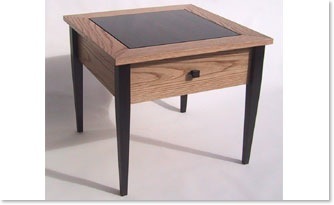 A small side table with an integral drawer made from solid oak and rosewood. The top solid section of rosewood “floats” in the oak frame to allow the woods to naturally adjust to the different ambient humidity. 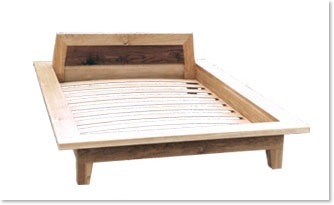 Drawer made with sycamore sides and cedar of Lebanon bottom for fragrance. 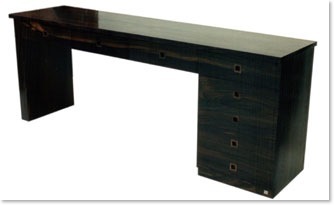 This piece was made with all of the refinements of high end cabinetry with fine handcut dovetails throughout and the top set of drawer fronts are all made from one continuous section of solid dark wood to maintain the figure of the grain. 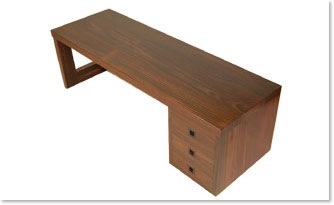 This low desk was made to complement the zaisu chair (shown on the right). It was made with inlaid handles and at the request of the client we also made a secret compartment within the joinery which as yet still remains a secret. This traditional Japanese chair that sits directly on the floor is still widely used in Japan although can take a little getting used to for the person accustomed to sitting on a chair with legs. 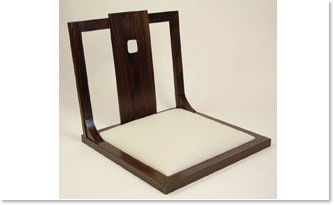 This chair was made in solid rosewood with a cream leather insert.